I remember a time T and I were parked in our garage, and we had a minor tussle over whether the cats could respond to T’s voice when called. I claimed that it was purely coincidental, or the cats would respond to a certain sound rather than by their specific name. However, over the past year, after living with the cats on a daily basis, I have been officially converted into a cat believer. So, T, I apologize for doubting you and the cats. With that said, we proudly present to you the first of a series of videos featuring Jules the Cat. For the past few months, T and I have been putting Netflix on hold, instead focusing more of our time on other things besides sitting in our tv room. We’ve been more selective of what we watch, recording our favorites (Top Chef, Project Runway, Cubs Games, etc.) on TiVo, and occasionally renting a DVD. If we were to head over to our local Blockbuster, we’d have to shell out $4-5 for a DVD. Instead, we take a leisurely walk to the neighborhood Jewel and rent a DVD from a kiosk called Redbox. Redbox has been around for awhile here in Chicago, and after a little wiki research, I found out a bit more about how the company started with grocery items and DVD kiosks at McDonald’s. The company quickly discovered that the vending machine grocery thing wasn’t working, so they focused instead on the DVD kiosks. You may have to wait in line. To avoid this, you can reserve your DVD online and just pick up your selection very quickly. However, if there’s a line, you still won’t be able to jump ahead. The DVD selection is pretty weak. Unless you’re a big fan of Saw IV, White Noise 2, or Little Mermaid 3, you’ll be fighting with others for the new releases and movies that most of us would want to pay to see. It seems that Redbox likes to stock up on low budget horror movies, family flicks, and 2nd tier dramas. That being said, you can often rent for free. Redbox is currently offering free rentals on Mondays if you sign up for text messages. I also received free Wednesday rentals for August by doing the same. There’s also a website dedicated to free Redbox offer codes if you’re so inclined to do the research. So, what’s the catch? I imagine the limited selection of movies has something to do with how Redbox makes money. There’s also the “late fee” that they’ll charge you if you don’t return the DVD by 9pm the next day. I had to pay a few bucks for a bad movie multiple times, but that’s nobody’s fault but my own. I will say that their customer service has been positive, as I had a problem returning a DVD to a kiosk, wrote an email, and was promptly credited with a refund. In the end, if you’re looking for a cheap movie rental, and you don’t mind potentially ending up with a bad movie (I have seen a few good ones: Definitely Maybe, The Orphanage, No Country for Old Men), I’d recommend Redbox as a quick and easy way to rent a movie. Comments? How about the worst Redbox movie you’ve rented? If you’re a Fantasy Football junkie like me, you’re always looking for ways to improve your team (a.k.a. waiver wire pickups), and if you’re an iPhone addict like me, then you’re always looking for more ways to tweak your phone to do more and more (a.k.a. combing through the apps store). Fantasy Football Cheatsheet is a nice little free app that helps you keep track of your draft as it is happening. You basically see rankings of all players, sortable by position (top 400), and you can change their status to drafted (either by your own team or someone else). At first I thought there would be the option to then keep track of your team during the season, but I did not find that option. In addition, I was unable to find any stats for players to use during the draft. This limited my use of this app during my actual draft. Perhaps, these features will be included in a future update. Honestly, if you’re doing your draft online (ESPN, Yahoo, etc. ), the online draft programs can essentially do what this iPhone app does automatically. I suppose if you’re away from a computer, this app can help you keep track of who you have and who’s available. The interface is very nice, easy to use, and responsive. Thus, future updates may be promising. Now, if you’re looking for a way to keep track of your fantasy players, you may not have to look further than an application that you probably already have as a sports fan. Sportacular has proven to be the go-to free sports app for the iPhone. I had Sportstap and didn’t care for it that much (it might be better now after updates). 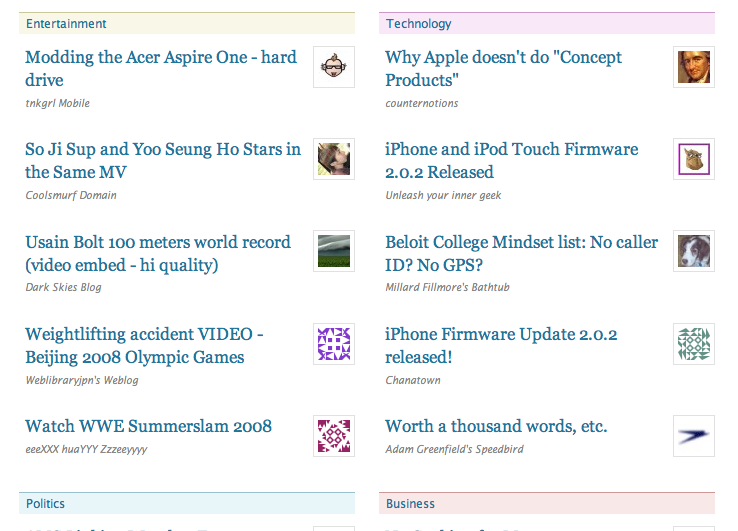 I’ve been using Sportacular instead, and have been pleased with its interface. What I forgot about was the program’s built-in fantasy stats tracker. As seen in the picture, you can insert your own team’s players through the “contacts” like interface. Everything was simple, fast, and responsive. The application reminded me of the fantasy football webapp that I’d briefly used previously, and the similar logos lead me to believe that they’re from the same company. Nevertheless, the Sportacular app provides stats (updated during the game, I believe) on your players, and I’m glad to see that it’s integrated in an application that I already have. Finally, you can add fantasy teams for multiple sports, so it’s not just for football. I’ll make additional edits as I play with this during the season. Either way, I highly recommend it to all sports fans and fantasy junkies alike. Inviting comments: LT or AP for the #1 pick? Also, are you picking up 2 RB’s or RB/QB or WR with your first 2 picks? EDIT (9/2): Without WiFi access at a live draft tonight, I may be relying on the Cheatsheet iPhone app to help me out. I’ll add an edit later to let you know how things go. EDIT (9/3): Sure enough, the Cheatsheet iPhone app was a success. If you have been keeping up enough to know about current injuries and do not need stats at your disposal, the app does a great job of keeping tabs on who’s been drafted (not to a specific team, except “your team” or “other team”) and who’s available, all sortable by ranking and position. It proved very handy for me last night, and it “only” crashed 4 times during a 3 hour draft. EDIT (9/14): Interestingly, I’m currently using ESPN Mobile more often than anything else. With 3G or a WiFi connection, it’s a pretty smooth website, and I find it very navigable and easy on the eyes. Since I have both of my teams through ESPN.com, it’s convenient. For those who do not, I’d still recommend Sportacular. EDIT (11/9): It looks like there are a few additional apps that pop up from a “fantasy football” search in the iTunes app store. Unfortunately, none of them seem to be generating any buzz, so I will stick with my recommendations as stated above. Let me know if you have a positive experience with any of the new apps. Well, T and I are up in Galena, IL working on wedding planning stuff. It’s time for a tech break! A few posts back, I wrote about how I am using Evernote to stay on top of things and try to keep my “Inbox Zero” dream a reality. Before I discovered Evernote, I was and am continuing to use Remember the Milk (RTM) to keep track of all of my to-do’s. There are a lot of to-do list helpers, programs, and now, iPhone native apps. I’ve tried quite a few, but RTM is one that I’ve stuck with for awhile now. Although there is no native app yet, they are working on one, and until then, you’ll have two options: the webapp (free but slow) and Appigo’s ToDo ($9.99). With the iPhone webapp (requires a RTM PRO account, $25/year), I pretty much have access to the same interface as the web version. Since it’s a webapp, its performance is linked to your connection speed, so WiFi and 3G are generally quite responsive, while EDGE is headache prone. As mentioned above, I’m holding out for a native app, but Appigo’s ToDo has gotten solid reviews, and seems to sync well with RTM. 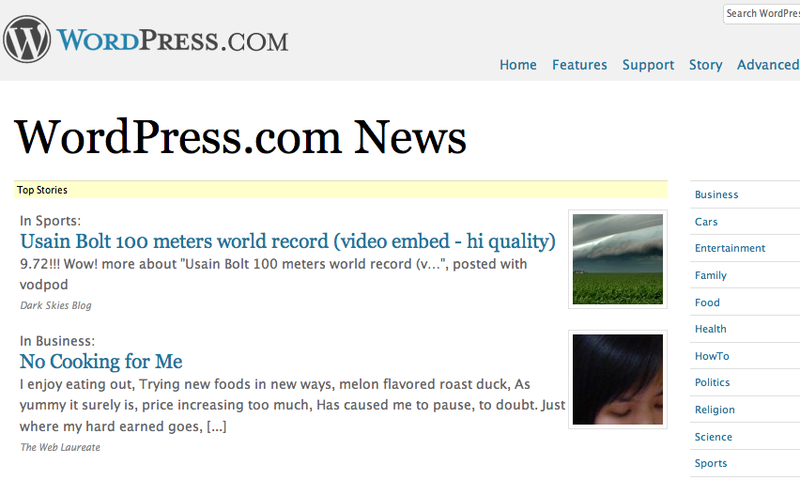 Hey Ma, I’m on WordPress.com News! …and there I am (4th one down, true, but still there nonetheless)! Yay!!! No matter what happens from here, I can always say that on 8/19, I was going somewhere with this. 100,000 miles and counting…down to the 2010 Prius. 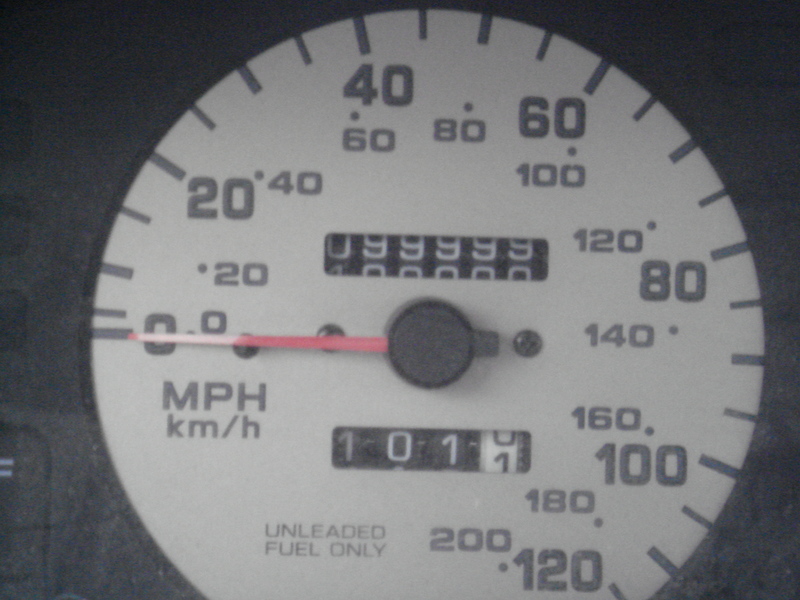 Well, special thanks to T for taking this photo (along with several others – I was adamant about capturing the moment) of my Nissan Altima turning 100,000. This is the first car that I’ve owned (thanks to my ‘rents for some help as well) and I’m happy to see it make it this far. And since T and I are getting married this year, we’re going to have to hold out just a bit longer for a new car. This will hopefully coincide well with the new 2010 Prius to be released in the fall of 2009. We drove a rental Prius on a recent trip to California. It’s pretty cool that they let you rent these cars, though once we were on the California roads, it seemed as if we were in the majority, rather than the minority. For all you gadget guys and gals, you’ll love the Prius. Seriously, I am sold. Before we rented one, I ordered brochures of cars I thought would be in the running for the Altima’s replacement: BMW 3-series, Acura TL, Infiniti G35, Lexus IS250, Honda Civic, and the Prius. I was awed by the Beamer’s “Ultimate Driving Machine” label, the TL’s all around performance, the G35’s style, the IS’s sportiness, and the Civic’s durability. Where the Prius lacked in these areas, it more than made up in terms of space, comfort, and gadgets! The Prius takes a bit of time to get used to visually. However, I suspect it’s one of those things that you end up either loving or hating. I now heart the Prius. This came mostly after driving one for a few days. As I mentioned earlier, the Prius is essentially a gadget on wheels. I found it mesmerizing to watch the energy conversion and it seemed like I was playing a video game while driving as I saved more gas and strived for the high score in the MPG “game”. Add to that a navigation system, the nice interface with the CD/Radio on the dash, that quirky push button start, and the keyless entry systems, and you’ve got more gizmos in a car than any other one I’ve seen. With regards to the 2010 design, I’m looking forward to the new styling (slightly bigger, yet less boxy), a stronger engine (1.6 L), and even better mileage (short of 100 mpg, I’m sure, but more than 40). I hope they don’t skimp on the gadgets as they move forward with the new line. Waiting list, here I come! iPhone Firmware Update 2.0.2 released! Just saw this on macrumors, and am currently downloading and installing. Another 250mb download! Wasn’t it not too long ago when 2.0.1 was released? Granted, these are bug fixes, and sometimes it’s hard to feel the difference, but how long did I have to wait for one update to my i760? Almost a whole year! Special thanks to SP&F for the generous gift of the Flip Mino Video Camera. I’ll post a gadget review in the next few weeks. T thinks that the air horn is part of the Air and Water Show that’s occurring this weekend. Never mind that the horn has been filling the air for the past few weeks (practice, she says). Pay no attention that we are 1/2 mile from the lake and farther from North Avenue Beach. What I’m most excited about is that she has agreed to go on a search this week for the source. On Monday or Tuesday, we will hop on our bikes, and ride around the neighborhood in the hopes of finding the person in charge of that air horn. Who knows what we’ll find when we meet the source? The days are numbered in terms of prize eligibility for my earlier post. If I find the horn, I’m treating myself to a slurpee. ADD (8/19/08): It wasn’t the air and water show, as I hear it full blast today, Tuesday, August 19. Argh. T may have stumbled upon a big clue. Unfortunately, we hear the horn more during the day and have not noticed any sounds at night.